Electronic cigarettes, commonly known as e-cigarettes or simply e-cigs were invented in a bid to offer a nicotine fix without the side effects of traditional tobacco cigarettes. However, e-cigs pose a unique risk that tobacco cigarettes don’t, and that is an e-cigarette explosion i.e. the cigarette blowing up in your face or pocket. Although it’s usually the battery that explodes and not the device itself, we’ll still refer to it as an e-cig explosion. E-cigarettes, vape pens or electronic cigarettes are handheld, battery-powered devices that have been invented to emit doses of nicotine in the form of vapor for their users. However, e-cigs come with some risks. One of these is e-cigarettes explosion which refers to a situation where the battery of the device suddenly explodes in the pocket or face of the device user. First offered for sale in 2007, the devices have become extremely popular in the last few years. Thankfully, e-cig explosion isn’t a common occurring, but when it happens, it can cause severe damage, from property loss to severe injuries such as skin burns, fractured bones, broken teeth, and loss of eyesight. A 57-year old Vietnam War veteran in Florida sustained serious injuries after the e-cig that he was using exploded on his face. According to ABC News, the explosion knocked out some of his teeth while leaving him with injuries on the tongue. News on 6 ran a story about an Oklahoma man’s home that caught fire when an e-cigarette he was charging on the laptop exploded. The explosion ignited a fire that burnt the laptop, lamp, part of the bed and shades. A North Carolina firefighter was hospitalized after an e-cigarette exploded on his face. The man, who described the incidence as ‘’a bunch of oil hitting his face,’’ said his eyeball sustained injuries that still affect his eyesight. A YouTube Video posted by ABC News in January 2016 showed a man’s spare battery exploding in one of his pockets at a gas station in Kentucky. The battery reportedly had a short circuit on coming into contact with coins in the man’s pocket. This resulted in second-degree burns. According to CNN report, a fatal case was registered in St. Petersburg, Florida due to the e-cigarette explosion. This case is considered to be an accident and happened for the first time with such consequences.”The two major causes of dramatic failures with the larger units are overcharging of the battery and then the shorting of the battery,” said the chief financial officer of the Tobacco Vapor Electronic Cigarette Association Thomas Kiklas. One of the notable things about e-cigarettes explosions is that their amount have been changed as the market works on this problem. So far, there are only about 195 cases of e-cigarettes explosion that have been officially reported by 2016. The most recent case of a lethal e-cig explosion was in Fort Worth, Texas. On January 27th, William Brown, 24, was using a mechanical mod outside a vape store when it exploded. He had gone into the store, Smoke and Vape DZ, to ask for advice on how to use a mech mod. He left the store and started vaping in the parking lot where the accident occurred. The store manager called an ambulance as soon as he heard the explosion. The debris left Brown with serious injuries, including a severed carotid artery. He died two days later from a stroke. 50 were caused by spare batteries. However, it is crucial to note that e-cigs with removable battery mods use common batteries for other devices including flashlights too. Based on the above analysis, the extent of the damage caused by e-cigarettes explosions varies. It is also apparent that e-cigarettes explosion has different causes. There are various causes of e-cigarette explosion. These have been highlighted in FEMA (Federal Emergency Management Agency) publications and media reports. Use of chargers that are different from those recommended by specific e-cig manufacturers. Use of substandard or re-wrapped batteries that have inaccurate ratings. For example, a rewrapped battery can be labeled as 30A rating while in a real sense it is 20A only. In this case, the battery overheats and explodes when put on a current of 30A. Using batteries that are faulty or damaged. Batteries that are already damaged are a great risk since they can explode anytime even when being stored. Lack of information on the recommended charging limits for e-cigs batteries. For instance, 18650 batteries should be charged and recharged at temperature ranges of 30 to 100F and 20 to 120F. If the user does not know the recommended limits, they are likely to suppress the battery thereby causing an unpleasant reaction. Moving around with spare batteries in the pocket. When carried in a pocket, the battery can come into contact with metallic objects that can cause a short circuit. According to Electronic Cigarette Fires and Explosions, a report published by the U.S. Fire Administration in October 2014 shows some interesting data about e-cigs exploding, an estimated 80 percent of all cases of e-cigarettes explosion that have been reported took place during charging. Additionally, only handful injuries from all reported cases came up until early 2015. In fact, the document reports that victims sustained nine injuries only from all incidences that were reported between 2009 and 2016. Some cases of e-cigarettes explosion have occurred during use. However, there is a growing concern over spare batteries exploding in user’s pockets. In an attempt to reap more profits from this lucrative industry, some manufacturers have come up with low quality and cheap vaping gears to lure unsuspecting customers. While getting these products is usually easy, they carry a greater risk. Trusted brands offer vaping gears that cost a little more. However, products from trusted brands offer better and safer vaping experience. Using them is a smart move when it comes to preventing e-cigs explosions. Manufacturers of vaping devices provide atomizers with low resistance coils to enable users to experience thicker and bigger clouds. However, such coils strain the batteries thereby making them operate at their highest level for longer. When buying batteries, it is important to note that the lower the resistance, the higher the voltage required. Manufacturer of these devices indicates specific batteries that should be used with the atomizer. Therefore, before you use these batteries, read the instructions on the device label carefully. 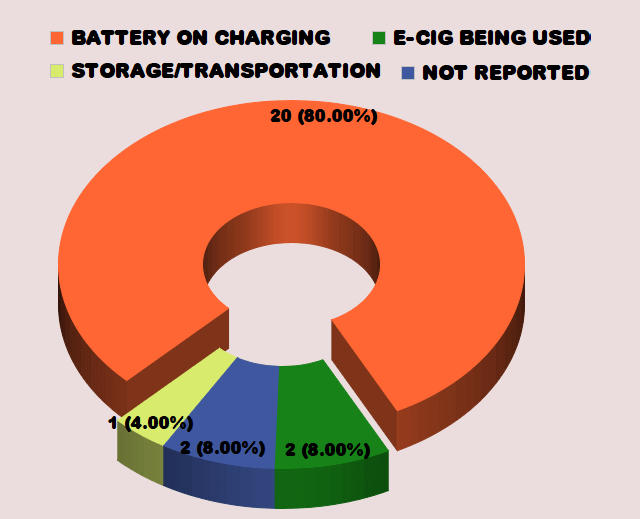 Use of the wrong charger is one of the major causes of e-cigarettes explosion. From the known cases of e-cig explosion, about 80 percent of all of them took place when the batteries were being charged. After investigations, it was established that most cases resulted from the use of chargers that are different from those stipulated by the device manufacturers. Although some chargers can conveniently work with e-cig batteries and other devices, their charging rates can exceed the recommended limits of the batteries. To stay safe, it is therefore advisable that you use the charger specified by the manufacturer of your battery. Whenever the e-cig battery is charging, it is advisable that you check the progress periodically. In most cases of e-cigarettes explosion that have been reported, users were around and able to control the fires on time. If they were not around, it is possible that the damage could have been extensive. Therefore, do not go to sleep or even leave the battery charging while away. If batteries are left attached to the charger long after they have charged fully, they start losing the ability to hold power. Due to the overflow of electricity from the batteries, they can easily explode. Carrying spare e-cig batteries in your pocket is another major cause of e-cig explosion. Whenever the batteries come into contact with metallic objects like keys, coins or buttons, a short circuit can occur. This can cause an explosion that can cause serious injuries like skin burns. For users that must carry spare batteries around, there are safe plastic cases that can be used to store them. These are easily available and they can be bought from local and online vendors. Without these cases, batteries should be stored separately. They should be kept in places where they cannot come into contact with objects that can cause short circuit. Generally, all e-cig batteries should be kept in cool and dry conditions without exposure to too much heat. If the batteries are exposed to high temperatures for a longer duration, they can overreact and explode. Even when kept in the right cases, e-cig batteries should not be stored in areas with direct sunlight and too much heat. As soon as a defect is noticed on an e-cig battery, it is advisable to immediately discard it. 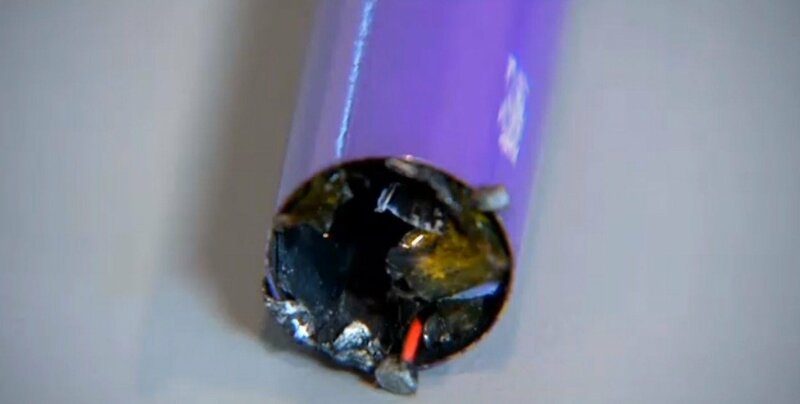 Remember that even small defects on e-cig battery can cause severe harm. E-cigarettes and their accessories come in smaller packages. That is because they are designed to enable users to easily move around with them in their pockets and use them conveniently. For users that may wish to carry e-cigs in their pockets, it is recommended that they switch them off before putting them in the pocket. Some e-cigs have locking features that can also help prevent cigarettes explosion. Locking the device even when in use prevents the voltage from changing suddenly. This provides a safer vaping experience. Regulated mods come with a form of protection that is not found in mechanical mods. While we may recommend using mech mods, they require a lot of experience in e-cig hardware and batteries to use. Thus, users should only opt for them if they are well-versed with their usage. Overall, e-cigarettes explosions are not common, but they can have dire cause injuries or damage if they occur. However, it is possible to use e-cigarettes without the fear of an explosion. Users need to take the precautions discussed in this article and be keen on the use and storage of their devices to ensure their safety.